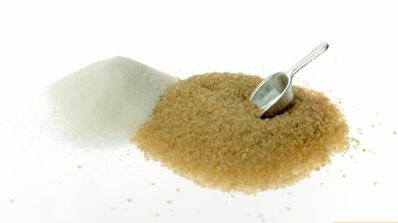 Nations Press feature health White Sugar vs. Brown Sugar,Which Is Better?? White Sugar vs. Brown Sugar,Which Is Better?? SPONSORED LINKS Is brown sugar a lot healthier than the “empty calories” of fully refined white sugar? Doesn’t “refined” mean “taking all the good stuff out”? Now this is very different from the story going around in 1900, when sugar refiners were trying to create an oligopoly to stop the plummeting price of pure white sugar. As part of their effort to control the market, they released micrographs of harmless (but scary-looking) bacteria that lived on brown sugar. This was so successful that the 1900 edition of the Boston Cook Book warned that brown sugar was undeniably inferior to “pure” white sugar, because it was infested by “a minute insect”. To a chemist, “simple” sugars include glucose, fructose and galactose. They each have six carbon atoms, 12 hydrogen atoms and six oxygen atoms arranged into a rough circle, with the atoms arranged differently for each sugar. Sucrose (our regular table sugar) is the combination of glucose and fructose. During processing, the stuff that is removed to leave behind pure white table sugar is called “molasses”. In addition to various sugars, it can contain microscopic amounts of hundreds of vitamins and minerals. Amounts of these micro nutrients can range from totally absent to micro-quantities, depending on the type of plant, season, rainfall, altitude of growth, fertilizers, hours of sunshine, soil, and so on. But while tiny amounts of, say, antibiotics, hallucinogens of nerve poisons can really change your day, not one of the micro nutrients in molasses has any similar power to affect you. Today, brown sugar can be made in two ways.